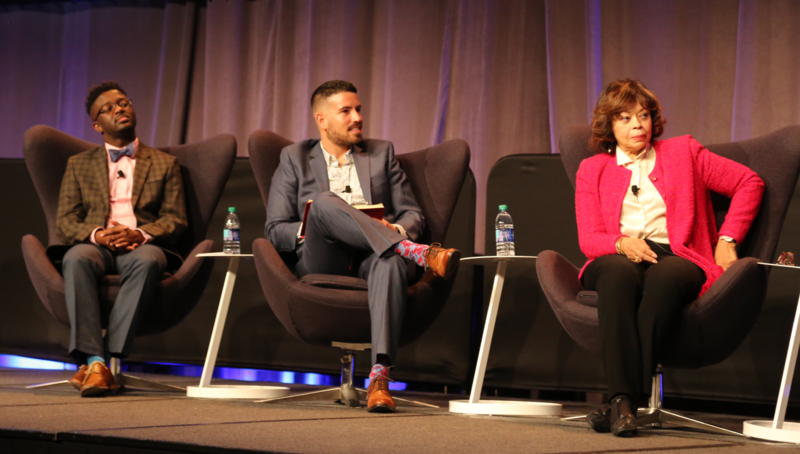 HIV-related stigma and its impact on HIV-related health disparities were the topic of the final plenary session at CDC’s National HIV Prevention Conference. The March 21 session examined social and cultural factors that have contributed to stigma as well as efforts to combat the effects of HIV-related stigma on specific populations. Moderator Johanne Morne, director of the New York State Department of Health AIDS Institute, reminded the conference participants that stigma is an historic and continuing theme that must be addressed to improve outcomes along both the HIV prevention and care continuums. Greg Millett, vice president and director of public policy at amfAR, delivered the keynote address, “Progress: Same or Different? HIV Stigma at 37.” He noted that while many of the most extreme forms of stigma from the early days of the HIV epidemic have dissipated over time, inaccurate beliefs about the HIV risk of casual social contact persist. Such stigmatizing beliefs are supported by societal factors such as HIV criminalization laws, Mr. Millett said. He pointed to the fact that 29 states still have HIV-specific criminalization laws on the books and while over 800 people have been prosecuted using these laws, none of the prosecutions were for any actual HIV transmission. He highlighted a CDC assessment that found that HIV criminalization laws have no detectable HIV prevention effect given there was no association with HIV diagnosis rates or AIDS diagnoses in states with such laws. Further, he observed that not only are people with or at risk for HIV too often stigmatized, but the effective tools to prevent HIV such as PrEP are also stigmatized. A recent study found that individuals who experienced a high degree of stigma around their choice to use PrEP were 50% less likely to be on PrEP at their next clinical visit. Additionally, he pointed to syringe services programs (SSPs) that are known to reduce the risk of HIV transmission among people who inject drugs. Yet, stigma related to both HIV and people who use drugs limits public support for SSPs, limiting their expansion in many communities that could benefit from them, he said. One factor that may enable this enduring stigma, Mr. Millett posited, is Americans’ lack of personal knowledge of people living with HIV. A Kaiser Family Foundation study found that only 45% of Americans say they know someone with HIV. To counter that, he encouraged more people living with HIV to be open about their status since that would contribute to stigma reduction. He also applauded creative efforts from the HIV community to combat stigma. These included public announcements by people living with HIV of their status on social media, anti-stigma campaigns, and even a series of social media videos about living with HIV. A series of presentations followed, each discussing unique approaches to combating HIV stigma and offering recommendations on how to help reduce it to improve HIV prevention and care outcomes. Daniel Driffin, co-founder of THRIVE SS, discussed building innovative, community-driven solutions to address HIV disparities among African American men living with HIV. Originally founded as a support group in Atlanta, the program has grown to an online platform that engages and offers support to more than 3,500 people across the southeast United States. Among THRIVE SS’s innovations are programs to re-engage and retain men in HIV care, a mental health group, and a photo campaign. Mr. Driffin shared results of a 2018 program participant survey that revealed that 92% of the men surveyed self-reported being virally suppressed. 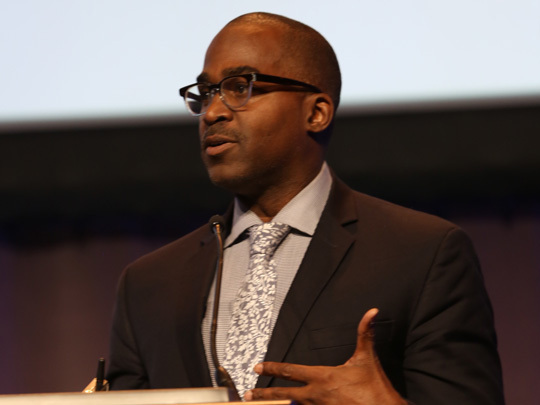 “Black men living with HIV are achieving viral suppression,” Mr. Driffin declared. “I challenge you to no longer say these men are ‘hard to reach.’” His advice for others seeking similar outcomes included: using the lived experiences of people living with HIV to inform HIV care and prevention, re-imagining everything, and supporting community-created approaches. Omar Martinez, assistant professor at Temple University’s School of Social Work, examined HIV-related stigma among sexual and gender minority Latinx individuals. He observed that members of this community often experience stigma related to many aspects of their lives including culture, language, and immigration status, all of which impact their HIV risk. Dr. Martinez profiled several programs that have demonstrated success, including a number that engage non-traditional partners or that address legal and other needs. He advised stakeholders to focus on affirming models of care; to examine immigration status as a social determinant of health; and to continue to invest in the development and replication of “locally-grown” HIV prevention, treatment, and anti-stigma interventions that have proven effective. Gail Wyatt, PhD, professor and director of the UCLA Sexual Health Program, discussed HIV stigma and disparities among African American women, reminding the audience of the importance of the inclusion of women’s perspectives in HIV prevention, care and treatment, and research. She discussed the impact of trauma on women’s health-seeking behaviors and treatment retention. She emphasized that an effective HIV response requires attention to holistic health, including mental health, to improve outcomes for women living with HIV. She also argued that some health care providers need to be re-educated about African American women given that many have biases about Black women that may hinder their delivery of effective health care services. Cecilia Chung, co-director of programs and policy at the Transgender Law Center, shared her personal story as an Asian transgender woman living with HIV and discussed the power of personal storytelling to change hearts. She remarked, “Storytelling can help us get past differences, stigmas, and biases, and humanize individuals.” Being able to confidently tell one’s story affects the listener and also empowers the storyteller as they move forward on their path as a person living with HIV. Dr. Eugene McCray, Director of CDC’s Division of HIV/AIDS Prevention, closed the session, thanking the participants from across the nation and the more than 500 of them who had shared results of their work with others in sessions, poster presentations, and exhibits during the conference. He noted that CDC was pleased to have been able to share more details of the Ending the HIV Epidemic Plan through several plenary session addresses and in a community engagement session. Implementing that Plan, he observed, will require ongoing dialogue and collaboration. With the powerful tools now available, the insights that data offer, leadership from all sectors, and community-driven and -developed plans, Dr. McCray indicated that he was confident that the nation could achieve the goal of reducing new HIV infections by 90% in ten years. To view all or part of this plenary session, view CDC’s National Prevention Information Network video of Wednesday's plenary session on their Facebook page.